Jimmy's National Podium's sure are adding up! The well traveled route from Norfolk to Yorkshire is becoming second nature now. 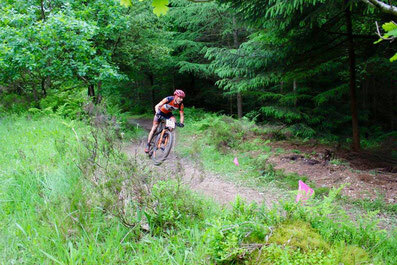 The 3rd visit in 6 weeks was made last weekend to Dalby Forest for the 4th and penultimate round of the National MTB xc series. Once a venue for World Cup mtb racing, Dalby is a fantastic course set on a rocky, wooded hillside with a good mix of demanding technical features and brutally steep climbs. 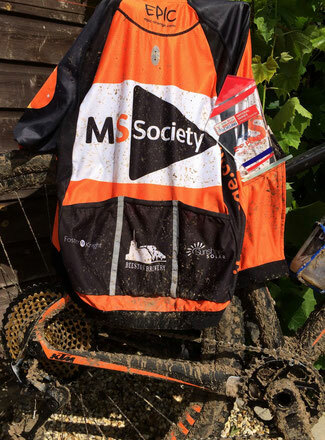 Saturdays persistent rain ensured the riding would be even slicker, muddier and tougher than usual though, and no-one was going home without a bit of Yorkshire grit stuck somewhere ! Sunday dawned to clearer skies and a fresh breeze that had begun to dry out the course just a bit...but not that much....this was going to be a messy 90 mins! 4 laps were scheduled for our race as we took the mid morning start line. A decent start put me in 3rd as we left the arena and into the twisting singletrack and almost immediately I was loosing touch with the first 2 riders, Owen and Tim, the winner from the previous round. A small mistake put me into 4th, being passed by Nigel as we completed the first lap. At half lap distance the course goes through a deep descending gully called Worry Gill. This is strewn with boulders the size of rugby balls and so rough your eyes rattle around in your head making it almost impossible to see. Holding on and hoping for the best I made it through again to the slightly easier section beyond only to see Owen picking himself out of the nettle infested undergrowth to the side of the trail, clearly a victim of the Worry Gill pounding. Now up to 3rd I caught Nigel on one of the steep climbs, passing him to move into 2nd at the end of lap 2. I was riding the main obstacles well but the slippery conditions were making me to be too cautious and I was loosing time over Tim, who was now a minute in front, and silly mistakes on very simple sections were letting Nigel stay in close contention, despite my best efforts to create a gap. Swapping positions numerous times this is how it stayed for the rest of the race until we reached the finish arena for the last time, Nigel just yards from my back wheel. A final push saw me get a few seconds gap to cross the line once again in 2nd. A tough day out that left me with mixed emotions. Disappointed to have not been in contention for the win but happy to have fought hard for the runner up spot. Glad to have made it round without injury but disheartened with the realisation that my bike riding 'skills' just aren't good enough to compete with the best. In 5 weeks time are the National Champs....better get on with some serious practice before then! 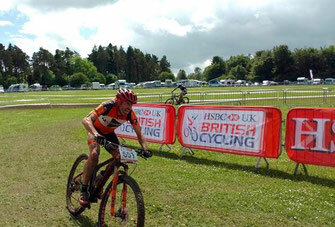 Well done to all the Eastern area riders who make the effort to compete at theses events. Thanks to Dan and Paddy for the company, mugs of tea and bike cleaning assistance. Thanks as always to Mike, Mark and Carl for their respective companies generosity, making it easier for me to compete again this year.